Remove wrinkles from clothing with ease with this steam iron, which features 9 temperature settings for precise treatment of a variety of fabric types and electronic temperature control for precision. With fabric guide to ensure proper treatment of different materials. 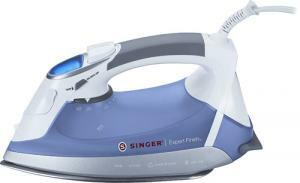 With burst and variable steam options for customized ironing. Turns the iron off automatically for safety. For easy cleanup and to prevent marking fabrics. I bought this iron because they didn't have the Rowenta. Had no idea how it would work, but I love it a lot and the price was just right. I do window treatments and I need a reliable iron and this one is great so far. Very easy to use and I love the different settings too. I was completely satisfied with transaction with your company and will definitely use your services in the future.